Since it’s mid November it also means Christmas is coming. 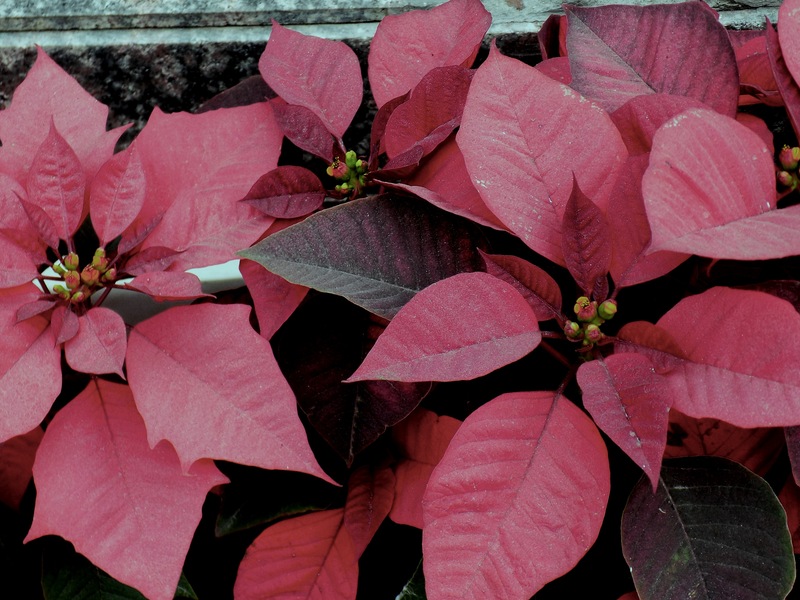 With the Christmas arriving, one cannot escape these beautiful red and green foliage of poinsettias. They automatically remind me of Christmas with there reds, greens and yellows. The spirit of Christmas should be everlasting in one’s heart; however, the day is not. Similarly these red leaves too, are temporary. I try to enjoy them till they last. I do get sad, when the leaves turn completely green and wait for them to change their colours during its season time. I enjoy the temporary colours in their temporary moments with an everlasting joy. Whenever and wherever I see these beautiful vibrant red leaf plants I’m surrounded by a fog of nostalgia. It reminds me of a very soon – to approach Christmas. The reds, greens and tiny dots of yellows, forms a very easy combination of a Christmas time, and immediately gushes me with the warm memories of a past Christmas. As a child, our school would close for winter vacation around the 20th or 23rd of December. Before going on a long vacation, each one of us would take time to neatly tear a blank sheet of paper and draw (at the best) our own interpretation of Christmas. That would be our Christmas cards; although, in the later years making of cards were substituted with buying read made cards. Where my artists friends drew candles and cakes, I drew these red and green leaves with golden balls at the center. I don’t know what made them smile, but looking at their happy faces I felt happy, too. At home these plants used to stay in a nice big pot. 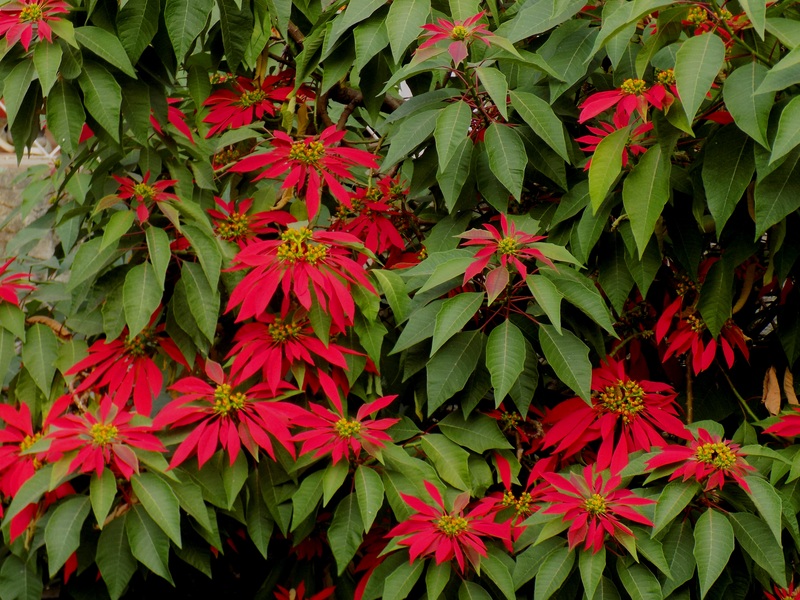 With the arrival of Christmas, Mr Red And Green Plant used to get a complete make over. I, along with the entire gang of siblings, used to decorate the plant with colourful streamers and balloons. On Christmas eve, we loved bursting and playing with those balloons. Of course, the streamers were spared as they would be reused the next time. When there is a chill in the air. When Christmas Songs play all day long. When the spirit of Christmas is on the loose. When giving is a joy, sharing is a blessing and receiving means being loved. When stars are hanging and trees are shinning with lights. When fun, feast and family all come together. When loads of sweets, chocolates and cakes are gobbled by the watch. When I turn deaf and blind to: stay fit and healthy. When I get to wear red and green together like a Christmas tree. It’s that time of the year, when I get to celebrate Christmas. Christmas is the time of joy, celebration and leftovers. I like this kind of leftovers; they are tasty, delicious and I can have them all. This leftover object that I’m going to talk about is nowhere close to being tasty. It is not edible at all; although it is durable. When I started working at least seven or eight years back I had saved some money. I wanted to invest it into something good and worthy. After a lot of thinking and gathering friendly opinions I finally wanted to buy a cross trainer. I have no idea how I thought of investing my hard earned money into something that was not even me. I’m not an athletic person, never was, never will be. But I still went ahead to buy a cross trainer. The only fitness equipment that I had seen at home was a heavy dumbbell. That was my father’s. It was quite heavy and I could not lift it when I was fifteen. I think I took the inspiration from there. It is not a sin to have a body in good health and shape after all. Would you not agree with me? When I got it I made sure to utilize it. So I came up with a workout routine. Everyday for fifteen to twenty minutes I used to exercise on it. I started with early in the morning before breakfast. With time I started to lessen the number of days then the time and finally I just would say hi to it. I really enjoyed spending time with it because I didn’t need a trainer or someone to help me and I was sure about the results too as I used to feel quite energetic. Since I was happy with the results I got motivated to use it daily without fail. I was using it daily and churning out my extra body fat with all the enthusiasm that I had. Then we shifted to a new city. It was difficult to move it and I was recommended to part it away. It was not the fear of parting away with this piece of machinery it was the money that I had spent on it that struck me first. Lastly it was the feel of being athletic and having a healthy body. Because of all this I didn’t want to part away this piece of equipment. Finally it did arrive with me to a different town. Somehow everything changed here because of too much work I started neglecting it. Very soon it started catching dust sitting at a corner of the house. Then when I found the time my knee was hurt and I could not use it. So all in all it has stayed as a masterpiece at one corner of the house for more than five years now. There is some hope that I would start using it although it will not be the way I used to in the past and that keeps me from selling it. I’ve found another use for it now that I don’t exercise. It is serves as a masterpiece and whenever someone comes by a point is made not to hide it but showcase it. It is good to see their curious and sometimes excited looks. Once I was asked to sell this by my friend. Of course the answer was no and always will be. Now and then I’m advised by my family members to sell this as it takes up space. But I can’t, it is not only an object; it is a masterpiece for me. It is not only a fitness equipment but a remembrance of my past. It is not a lifeless metal object; it shares memories with me and I will not part away with it. It is a leftover of a place and a part of my past that I would always love to cherish and remember. You cannot buy traditions, that’s a good thing, however, you could make one, that’s sounds comforting to me. They are simple to maintain (not always but sometimes). All you need to do is carry on a past one or introduce a new one or in some case totally drop it or find a long lost one and start it again…it could be your version or the real one itself. I’m perfectly fine with either of the options. Traditions for me always revolve around a festival (that would mean Christmas). Like my grandmother distributed gifts after the morning mass on 25th of December to all the children of the house (it had to be morning, not evening and it had to be 25th and not 24th evening or night although we used to be awake for carol singers). My mom started keeping gifts under the tree on 24th of December. Timing was very important over here; it had to be 24th midnight and it never changed to early 25th morning, at least till the time I was living with her it was like this. It made me feel like those movies where Santa was keeping the gifts, except we knew that there was no Santa. I have stuck with my mom’s version and keep gifts for the guests and family members under the tree; for the visiting guests and children I hang sweets on the tree. Perhaps I would carry grandmother’s version when I become one. Sundays are family days, everyone likes to relax a bit, energize and prepare themselves for the week ahead. Turning the Sundays into fun days is easy but I’ve introduced a lost tradition which was started by my grandmother and carried by my mom. That is, to have a small family prayer on Sunday evenings. I used to pray alone but now I feel praying together has brought us closer. It also gives inner peace and strength not only to me but to the others as well.